Foundation Supportworks helps clients with all types of structural repairs as well as waterproofing repairs. Foundation Supportworks works close with engineers, architects and contractors to complete the necessary commercial repairs in a timely, professional manner. We are local, so we can be extra responsive to our clients' needs. We know that issues can arise during construction and revisions are often made due to design changes, unexpected soil conditions, unearthed foundations or other reasons. We are totally committed to doing the job right and being prepared for just about any thing. Contact us today for a free commercial estimate in Providence or nearby. 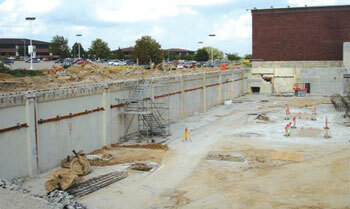 In Commercial or Residential applications, there is a lot of focus on the designs of the foundations. Foundations are most often designed for the loads of the structure, wind loads, soil classifications and other criteria where the structure is to be constructed. 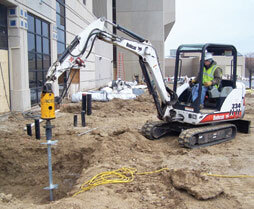 Supportworks Model 288 Helical Pile System is an extremely versatile deep foundation alternative, and is used within grade beams, pile caps in residential or commercial and industrial load applications. The Model 288 Helical Pile System can be installed with hand-held equipment, mini-excavators, skid steers, backhoes, or trackhoes, so the installation equipment can be sized for just about any project. Helical anchors are an alternative for commercial or residential projects, such as large retaining walls, and instances where the traditional wall anchor cannot be installed. A Helical Tie-Back is mechanically advanced into the earth using a hydraulic drive head to achieve pre-determined depths or load capacities. At Foundation Supportworks we have the products and experience to select the best method for just about any type of foundation problem. Our representative will work closely you and/or with engineers to give you a solution that will give you a peace of mind for years to come. 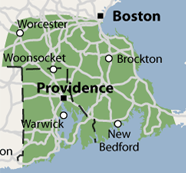 Foundation Supportworks provides commercial services throughout Massachusetts and Rhode Island. Contact us today for a free commercial inspection and estimate.